This Wednesday marks the 36th anniversary of the victory of the Islamic Revolution in Iran. Where does Iran stand now in the international arena? What is Iran's stance in fighting against Islamic State (IS) and its stance on the nuclear issue? 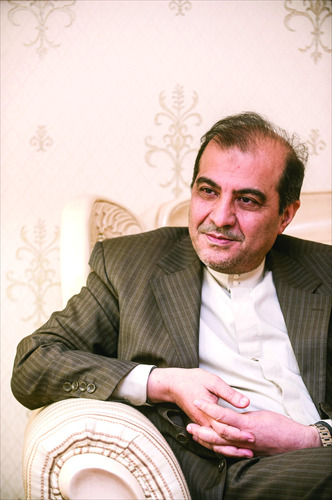 Global Times (GT) reporters Chen Ping and Li Aixin interviewed Ali Asghar Khaji (Khaji), Iran's Ambassador to China on these issues. GT: What kind of challenges are China and Iran facing to further deepen the bilateral relations? Khaji: Fortunately, both countries have had no challenging issue between them throughout their history. There are some countries that wish to affect relations between Iran and China. There is a joint responsibility on both sides not to allow any third party to affect the healthy relations between us. We don't have very strong institutionalized exchanges and contacts among our young people, researchers, think-tanks and people. Therefore, our knowledge of each other is limited. Even more importantly, unfortunately, most of the news about my country, broadcast in your country, and the news in your country, broadcast in my country, are obtained through third party sources. Indeed, correcting this weakness in our relations will be one of my priorities during my tenure in China. GT: The talks on the nuclear issue have been extended till the end of June this year, but no clear indication has been made of how to bridge fundamental differences. What are the main obstacles on both sides? And under what conditions do you think can a consensus be reached? Khaji: Before answering the question, first of all, I would like to express my appreciation of the very constructive role that China has been playing in the 5+1 negotiations. Actually, the answer to your question is very simple. The other side has their political agenda; they are holding a double standard over this issue. From the beginning, Iran has always said that it is pursuing nuclear energy for peaceful purposes. It has always been our motto that peaceful nuclear energy should be for all. Everyone should benefit from it. And nuclear weapons should be for none. But they apply a double standard and put political pressure on Iran. A regime that has produced nuclear weapons and has been threatening our region throughout its history is protected by the West. On the contrary, my country has always stressed its peaceful goals. Throughout the history of the International Atomic Energy Agency (IAEA), Iran has been the only country which has had the highest level of cooperation with it, more than any other country. And yet we are under sanctions. We are ready to do clarification over our peaceful nuclear activities. We are a signatory to the Non-Proliferation Treaty (NPT). We know that we have to fulfill our obligations. We also believe that we should benefit from our rights under the NPT. We are expecting to reach a fair solution to solve the nuclear issue in a fair and just manner. GT: We are experiencing a rapid fall in oil prices. How has the fall in oil prices affected Iran's budget and plans? Khaji: Certainly it has affected Iran. All oil-producing countries have been affected by this condition. The importers of oil may benefit from it in the short run. But, probably in the long run, even the importers will suffer. Because the instability of oil prices will seriously affect the production trend. The last point, when Iraqi president Saddam Hussein attacked us, we were very lonely, and there were very few countries that helped us. But we stood there and we fought. And even now, if anyone is under the impression that by pushing down the oil prices and putting pressure on Iran, they are able to force Iran to give in, I can only say they are committing this historical mistake once again. GT: How do you see the role Iran is playing in the Middle East and in the fight against terrorism? Khaji: Unfortunately, our region has been for so many years facing and dealing with terrorism. A part of this evil phenomenon existing in our region has its roots in dictatorships and the closed political systems that exist in some countries. And partly, it has its roots in the interference by major Western powers. But terrorism is not a phenomenon that only one or two countries can contain. It asks for international resolution and international coalition. The question is, are those countries, who claim to be participating in the coalition against IS, really serious in fighting against IS? We have a strong will in fighting terrorism. The really effective way of dealing with terrorism is to deal with the roots that produce terrorism. I also wish to emphasize that terrorism is by no means related to Islam or any particular religion, but rather, through distorted understanding and interpretation of religious beliefs and instrumental use of religion, terrorists try to push ahead with their ulterior agenda. The IS has killed so many non-Muslims as well as both Sunni and Shiite Muslims, which proves that what they do has no relation with the sectarian differences existing between Sunni and Shiite Muslims, who have always coexisted in a brotherly manner throughout history. GT: According to media reports, Iran and the US are discussing joint military cooperation to tackle IS forces. Is Iran likely to play a role in the US-led coalition in fighting against IS? Khaji: Our discussion with the US is merely within the framework of the Iranian nuclear issue. We have been cooperating with countries in our region. We are cooperating with the Iraqi and Afghan governments right now. We are cooperating with the Syrian government in fighting terrorism. We believe that in order to solve this problem, our region must take a unified action. However, we have an issue with the West. The truth is, they divide terrorism into good and bad terrorism. When it is fitting their interests, they cooperate with terrorism; when it comes against their interests, then they hit and fight terrorism. A big part of the ammunition and weapons used by IS right now are actually those which have come into their hands directly or indirectly through some third countries.